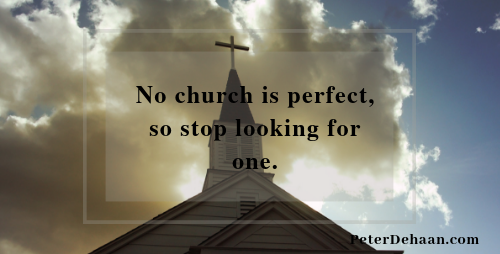 There’s an astute saying, “If you find the perfect church, don’t join it—because then it will no longer be perfect.” The reality is that as long as a church has members, it will never be perfect. That’s because we’re imperfect, so the churches we attend will be imperfect too, and they’ll fall short of the ideals we have for them. This means that finding a perfect church is an impossible task, one we’ll never achieve. Yet we persist in trying. We shop for churches as a consumer, looking for the one with the most options and greatest features—one that will best meet our needs—while asking as little as possible in return. We seek maximum value: great outcomes for a small investment. This is how the world would select a church. They’d follow the modern mindset and shop for a church. But it’s the wrong approach. Instead of shopping for a church, the perfect church, try this countercultural method to selecting a new church home. It’s a simple two-step process. The first step is easy, but the second step requires ongoing effort. Step one to finding a new church home: Go to the church that’s nearest your home. It’s that easy. This allows us to form a church community in our geographic community. Hopefully some of our neighbors will attend this local church too, which will allow us to worship God with our neighbors. Step two to finding a new church home: Do whatever it takes to make it work. That’s the hard part. It requires sacrifice, patience, and determination. Making a commitment to a church is much like making a commitment to marriage. In both cases, instead of bailing at the first sign of conflict, we commit to doing whatever it takes to make the relationship work. It’s long been my desire to go to church in my community and to worship God with my neighbors. Am I doing this? Sort of. My wife and I attend the second closest church. This is because we needed to be in agreement, since this would be the church for both of us. This church is .7 miles from our house (within walking distance). And several of our neighbors go to this church too. Though this church has many admirable qualities, it isn’t the perfect church. Yet we’re doing what’s needed to make it work. We’re getting involved, plugging into community, and seeking ways to serve. When it comes time to find a new church home, why not give this method a try. After all, has your approach worked any better?